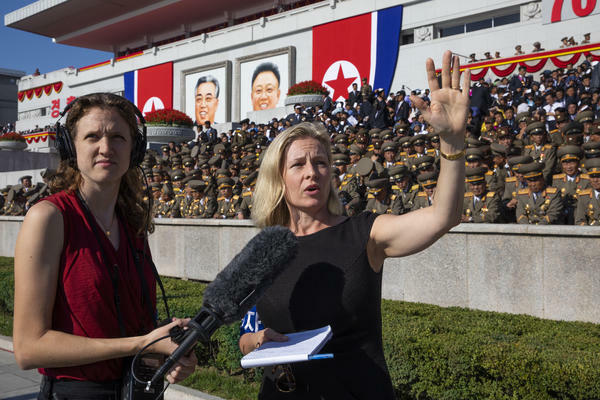 All Things Considered host Mary Louise Kelly (right) records a standup with producer Becky Sullivan at Kim Il Sung Square in Pyongyang ahead of a military parade marking the 70th anniversary of North Korea's founding. 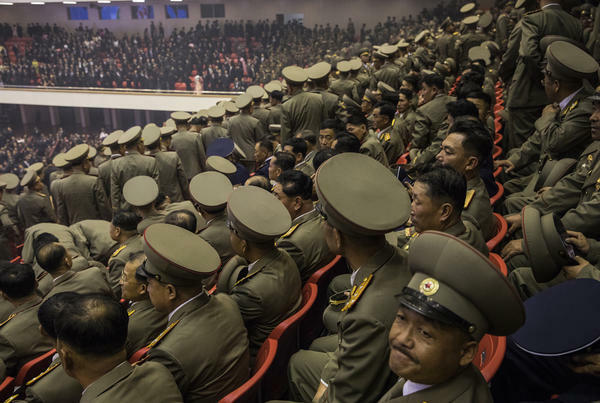 North Korean military prepare to exit a concert hall at the end of an orchestral performance to mark the 70th anniversary of the founding of the nation. 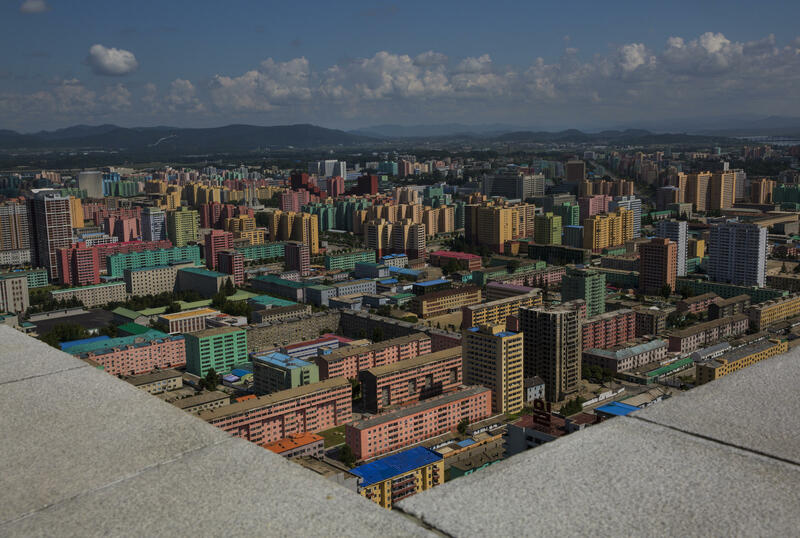 The North Korean capital Pyongyang viewed from the top of the torch-tipped Juche Tower. At a teacher training college in Pyongyang, Mary Louise Kelly interviews researcher Shin Yun Si. Each news outlet was accompanied by one or two government-assigned guides, seen here in suits and ties. 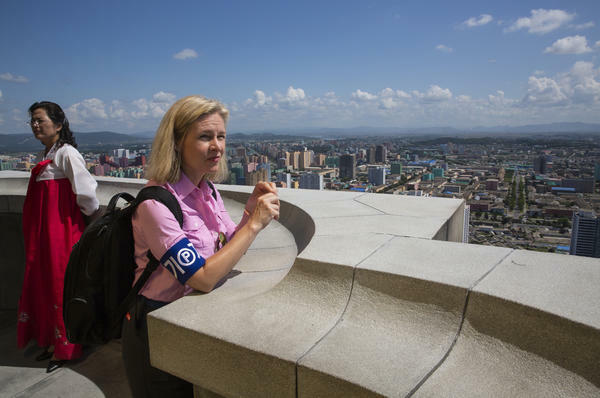 Mary Louise Kelly in Pyongyang. 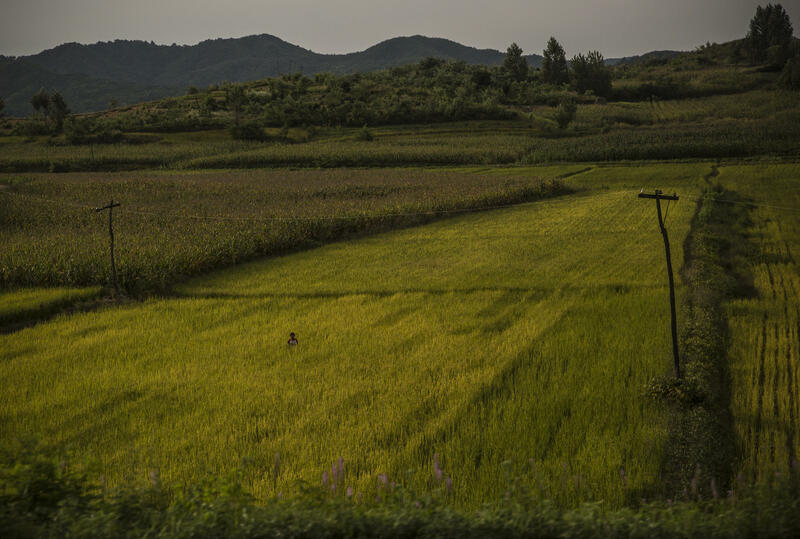 A North Korean farmer stands in the middle of a rice field in a rural area north of the capital city Pyongyang. All Things Considered host Mary Louise Kelly, wearing the government-mandated armband marking her as a foreign journalist, waits on a bus in Pyongyang. Mr. Kim is the guide assigned to us by North Korea's Foreign Ministry. We are charged $75 per day for his services, and they are not optional. (I'm using his last name only here, because he did not want to be quoted in any official capacity or appear to be speaking for the North Korean government.) He's been glued to my side from the moment we cleared passport control at Pyongyang airport six days earlier, acting as an interpreter, a fixer, a bridge between our worlds — and a stunningly efficient one-man journalism prevention service. Mr. Kim is staying at our hotel, the better to keep track of us, and we had agreed to meet beside the elevators at 9 a.m. It is NPR's last day in North Korea; our team flies out this afternoon, and we have asked to see a market, to ride the metro, to go anywhere, really, where we can glimpse daily life in the world's most isolated country. "It is too late for a last-minute request." "It's not last minute. I've been asking since —"
"It is impossible." He smiles and shrugs: What can you do? NPR is visiting North Korea on the government's terms. We were invited, along with news organizations from around the world, to cover the festivities marking the 70th anniversary of the country's founding. The whole media circus has been booked into the Yanggakdo ($112/night for a spartan, but perfectly clean, double). The hotel boasts a revolving restaurant on the 47th floor, a coffee shop that steams a decent cappuccino, and a bowling alley in the basement. Above the front desk, North Korean TV news video of goose-stepping soldiers loops on a giant screen. Before booking plane tickets, I'd written the Foreign Ministry with a list of interview requests, from North Korea's leader Kim Jong Un himself to military officers to school students. You will see anniversary festivities, came the firm reply. And so we have, from concerts to a moonlit parade of torches to a military parade on Kim Il Sung Square. All of which is to say, Mr. Kim is under no obligation to take us anywhere. His government has kept its end of the bargain. 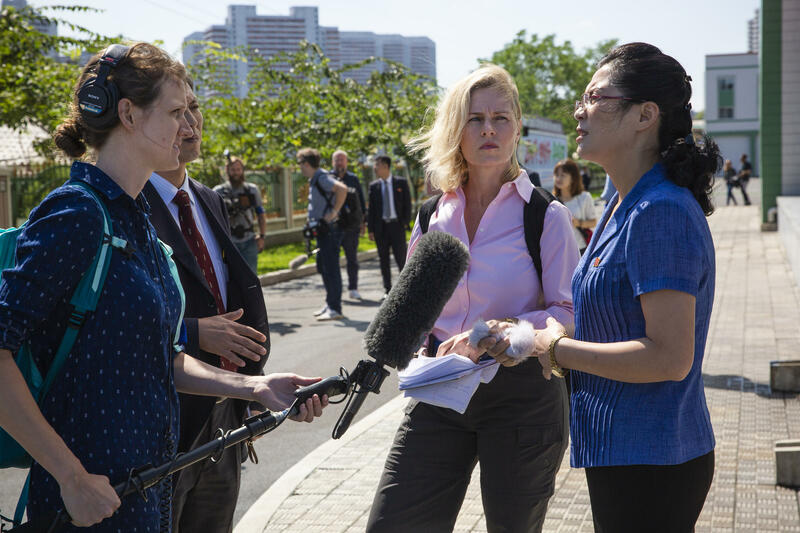 And it's tricky in North Korea — a country not renowned for its human rights record or for celebrating a free press — to know quite how hard to push. But pushing is the job, and so we push, and remind him that we've traveled thousands of miles and crossed 13 time zones to see his country, talk with people, and then tell an American audience what we observe. When Mr. Kim at last relents and announces we can leave the hotel after all, there's a catch. He eyes my right arm, on which I had been wearing an armband identifying me as a journalist. The armbands are royal blue and itchy, and we were forced to fork out $40 to rent them. It was a relief to hand mine over on our last night in the country, in preparation for our departure. It was also, apparently, a mistake. "You are not credentialed as journalists anymore," he informs us. "You may not interview anyone. You may not talk to anyone. You are tourists." Appropriately, we take taxis to a tourist trap: a souvenir shop in the shadow of Pyongyang's Arch of Triumph (modeled after the Arc de Triomphe in Paris, but 30 feet taller, for bragging rights). We browse posters and refrigerator magnets and the local mushroom liqueur. Aside from shop assistants, there is not a North Korean in sight, not a chance of striking up a conversation or interviewing anyone. And now we've been joined by a second government guide, Mr. Ri. I wind up for one last swing. All week, we've been asking to visit the subway, to witness the city's daily commute. There's a station across the street. "Can we go see the metro?" I check my watch. "There's time." "I do not have time," Mr. Kim clarifies. "Ten minutes. Just to see inside. We don't even need to ride it." He closes his eyes. When he opens them: "The metro is closed today." I teeter between exploding in frustration or in giggles. Neither seems wise. I try appealing to the second guide. Just a quick stroll on the train platform? "You might get lost," Mr. Ri says solemnly. "It is for your own safety." I never did see the Pyongyang metro. I never got a straight answer as to why the request was so problematic. Other journalists who arrived earlier than us for the 70th anniversary events were taken there, were allowed to ride and to interview people. I suspect the truth is both complicated and mundane. Restricting journalists' movements is hardly a new development for North Korea; I'm told NPR's experience is pretty typical. Think about it: What's the upside for the regime of reporters wandering around posing nosy questions? American reporters must be especially problematic, from a North Korean minder's point of view, both in light of decades of mutual distrust and suspicion since the Korean War, and in light of more recent developments — the U.S. travel ban and sanctions against North Korea and the current tense diplomacy. Meanwhile, on a practical level, Mr. Kim didn't seem to have much more control over where we went than we did. Those orders were coming from higher up; my guess is that our approved schedule really did call for us to chill in the hotel all morning, and he had to pull strings to bring us to that souvenir shop. I might have had more sympathy for his plight had we not struggled for access throughout our visit, at every turn. We visited a teacher training college but were not allowed to speak with students. ("They are in class.") After the military parade on Kim Il Sung Square, we walked along streets jammed with ordinary North Koreans, their faces flushed with pride. We were not allowed to speak with them. ("We have to get back to the bus.") One day, we drove 70 miles north of Pyongyang, to Mount Myohyang and a beautiful park where we were told North Korean families liked to picnic. When lunchtime came, NPR and other U.S. news organizations were escorted to a pavilion in the forest for Korean barbeque. It was delicious, a lovely meal — and not a North Korean family to be found. One day, after touring a silk factory, we peeked into a dormitory where some of the workers live. The facilities included a swimming pool and a rec room, replete with six pingpong tables. "Want to play?" I asked. He looked startled, and then a grin crept across his face. "Are you good?" "I'm terrible. My son should be here. He's superb." "Which one?" asked Mr. Kim, familiar by now with my family dynamics. "Both. My 12-year-old is better." I like to think I might have scored a point or two off him, but we couldn't find paddles, and the bus was waiting, and he said we needed to get back to the hotel. Next visit, Mr. Kim. I'll be practicing. I'll bring the paddles; you can spring for the metro fare to get there.